Above: The famed Kate Somerville Clinic on Melrose Place. 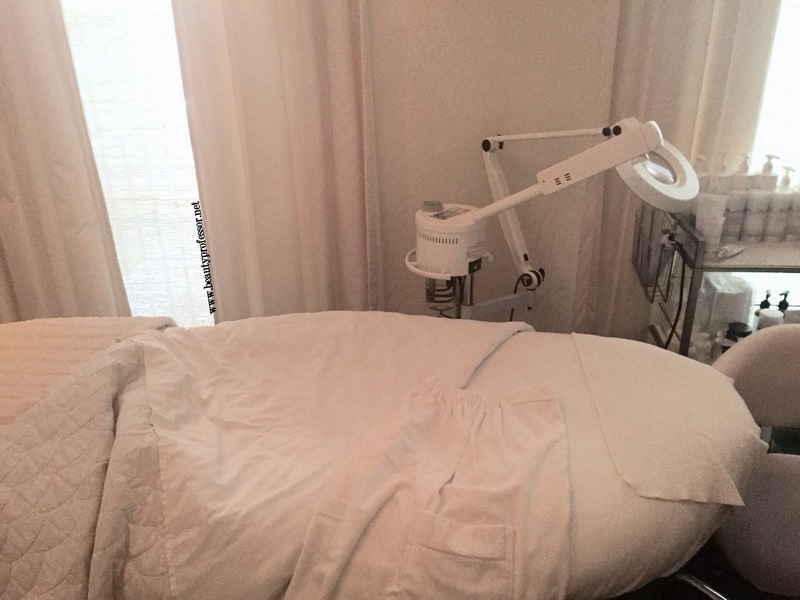 Earlier this month, I had the privilege of experiencing my first facial (ever, I might add!) at the Kate Somerville Clinic. Although I met the delightful Kate last month when hosting Project Beauty at Neiman Marcus (more on that soon!) and have discussed her products many times over (HERE, HERE and HERE), I had never had the chance to partake in the professional skincare process that have built her brand over the past decade. Consequently, I am excited to share my adventure with the LightStim Red Facial! Above: With Kate Somerville at Neiman Marcus Beverly Hills. Above: At the entry of the clinic. Aesthetically speaking, the Kate Somerville Clinic is stunning; the classic decor is reminiscent of a more civilized time...lush drapes, textured wall dressings and fresh flowers at every turn, this veritable wonderland of creams and greys emanates a relaxed energy. The reception area was welcoming and my aesthestician, Rachel, kindly ushered me to my room. Aboe: The anteroom that leads to the treatment rooms...each space is unique and handsomely equipped with cutting edge devices and signature Kate Somerville products. Above: Luxuriously quiet and endlessly comfortable, my treatment room was divine. I was given time to change into a terry cloth garment and couldn't help but snap a few cell phone pictures of my environs. The plush bed and linens, gorgeous white accents and perfectly prepared countertops were another indication of the excellent standards of the Kate Somerville Clinic. Above: The goggles for the LightStim portion of the facial...the last time I wore something similar, I may or may not have been, very regrettably, in a tanning bed. Above: Ready for my facial! Above: A cache of Kate Somerville, beckoning to be used. Because I opted to fully absorb the facial experience, I chose not to take notes or pictures during the actual experience. In turn, my recapitulation is rather truncated but wholly earnest! Rachel cleansed my skin with the Gentle Daily Wash and a Clarisonic. She then used the ExfoliKate Gentle (since my skin is sensitive) to remove dead skin cells and followed with a steam-enhanced, completely painless extraction session. I was heartened when she told me that my pores looked quite clear and extractions were, consequently, minimal! We then proceeded to the LightStim portion of the facial. I was given goggles to wear and Rachel very clearly explained how the lights would feel on my face (warm not hot). A targeted combination of enzymatic exfoliation, extractions and advanced LED technology leaves skin revived, healthy and soothed. The LightStim® Red Facial combines advanced red and infrared lights to increase circulation, reduce inflammation, and encourage deeper product absorption. It also stimulates collagen and elastin to prevent the early signs of aging and restore an overall radiant, healthy glow. During the 20 minutes of LightStim treatment, I received a gloriously relaxing arm and neck massage...truly the minutes just flew by. Rachel was a brilliant conversationalist and I enjoyed our exchange of favorite beauty products and other musings. 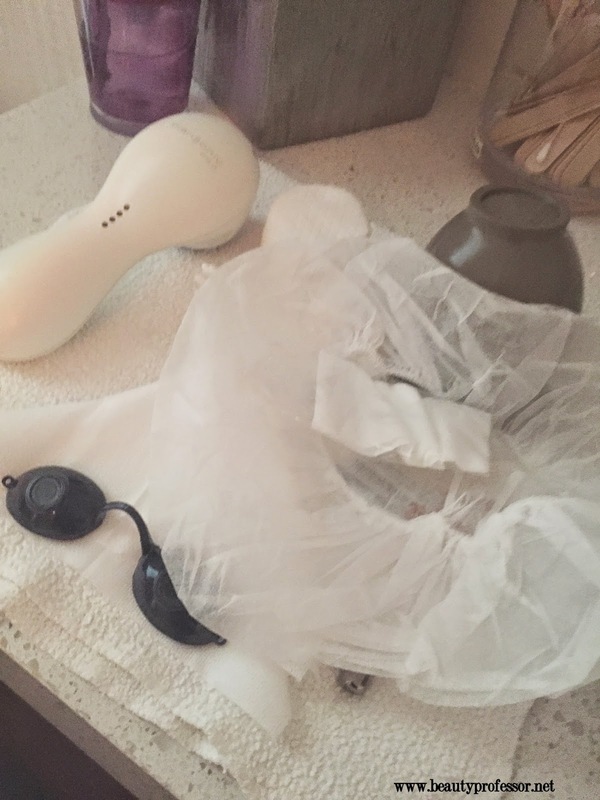 Following the LightStim, Rachel applied the world-famous Dermal Quench--I adore the cooling sensation--and finished the process by applying a trifecta of serum, moisturizer and sunscreen (detailed later in this post) to seal in the benefits of the treatment. 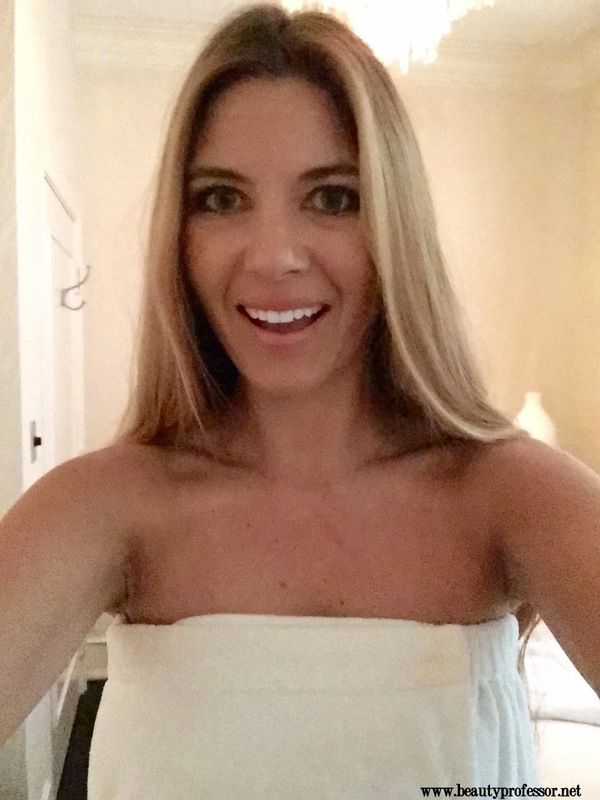 Upon completion of the Kate Somerville LightStim Red Facial, I felt entirely peaceful and relaxed and my skin looked and felt smooth and glowing, clearly nourished from the process! Above: Kate Somerville Director of Public Relations and me upon completion of my facial; she kindly gave me a tour of the entire clinic and the images that follow reflect our exploration of the premises. Above: Mirrors, orchids and Kate Somerville products, meticulously positioned on the wall...taste and serenity on another level. Above: I was enchanted by the impeccable crown moulding and countless number of chandeliers in the clinic...truly beautiful. Above: My skin, directly following the Kate Somerville Clinic LightStim Red Facial. Above: Key products employed in my Kate Somerville LightStim facial. Above: Rachel sent me home with a guide to both my LightStim treatment and a product breakdown for my facial...so helpful! Above: Swatches of each of the Kate Somerville products used in my facial. Above: Kate Somerville Director of Public Relations Meg Young + BP following a lovely lunch. Bottom Line: I am thrilled to report that my first LightStim Red Facial was utterly divine and I am spellbound by how instantly one's skin can be transformed by such an experience. My sensitive skin did not display the slightest bit of irritation and all day long (over the course of three separate meetings!) people continued to comment on how glowing and healthy my skin looked! I wholeheartedly recommend Kate Somerville's Clinic as a destination for serious skincare treatments and cannot wait to return again in the near future. 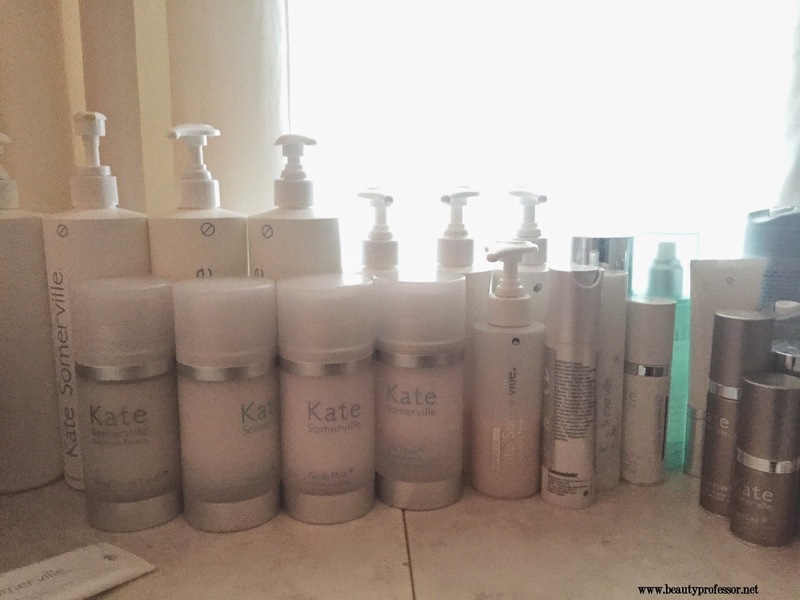 What are some of YOUR favorite Kate Somerville products? Good things ahead, including a fresh FOTD, a host of new foundation profiles and a round of product procurements...I hope your week is off to a lovely start! "My sensitive skin did not display the slightest bit of irritation and all day long (over the course of three separate meetings!) people continued to comment on how glowing and healthy my skin looked!" As odd as this sounds, it is refreshing to see a blogger who has sensitive skin. I have sensitive skin and it sure is hard to navigate through products on the market, trying to find products that address your needs, without causing your skin to react negatively. I've recently tried Sunday Riley Good Genes and the Artemis oil, and for one reason or another, my skin is NOT having it. Which I am extremely disappointed about, but there is nothing I can do about my reaction. I'm in the process of fixing my skin at the moment, but your post on Kate Somerville has made me consider looking at it again. I've used the Nourishing moisturizer in the past, but I haven't tried out other products from the line. On the top of my list is the Exfolikate Gentle. Thank you again for sharing your experience and products that worked for your sensitive skin. I do understand what works for one person, won't necessarily work for another, but it helps when someone narrows down an extensive list of products to a few that can be helpful. A facial at the Kate Sommerville clinic sounds fantastic for every beauty and skincare lover! I received her book at christmas from my husband ( he know me so well and it was not easy to get it here in Germany ) and I love it. It is THE best, so complex and explicit. Unfortunately they do not ship to my country but I received samples from sephora, LIKE! It was absolutely divine! I haven't yet seen her book but your recommendation makes me want to track it down ASAP!